DASARA - Dasara is celebrated all over India with a lot of fan fare and religious fervor. A religious as well as a social festival, Dasara is an occasion for pujas and festivities like music, dance and cultural programmes. According to Hindu mythology, a very powerful Asura-demon king Mahishasuran prayed to the almighty and asked for a boon - that his death should at the hands of a woman and by no other human being or any form of living being. On being granted his wish, he started inflicting atrocities on all human beings on the earth. He considered himself to be immortal as he thought that it was impossible for a woman or any female form of a human being to be powerful enough to kill him. When his cruelty became unbearable, people prayed to Sakthi the consort of Lord Shiva to save them from the demon and to provide them with salvation. Sakthi then took the form of Durga and slayed the demon. 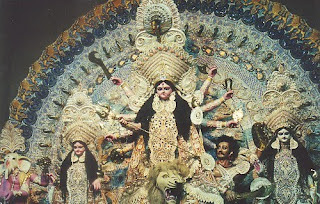 The fight between Durga and Mahishasuran is said to have lasted for nine days and nights. The period of nine days and nights when Goddess Durga fought the Asura is celebrated as Navarathiri in Tamilnadu. The Goddess is worshipped during these nine days and nights as it signifies the fight of the good over evil. Goddess Durga is considered as the personification of courage, strength, and power and praying to the goddess, helps one to be blessed with all these qualities especially during Dasara. The Goddess is worshipped in all her innumerable forms. Yaa devi Sakthi rupena Samsthitha, Namasthasyay, Namasthasyay, Namasthasyay, Namo Namaha. A Kalasam i.e. a pot shaped brass / silver vessel topped with mango leaves and coconut, smeared with turmeric and vermilion is kept and the Kalasam is worshipped with reverence. Special pujas are performed for the Goddess at home and in temples during Navarathiri. In the temples, the Goddess is dressed in different forms during these days like Annapoorani / Gajalakshmi / Durga / Meenakshi / Tripurasundari and so on. Processions of the idols of the Goddess are also taken around the adjoining areas of the temple. Married ladies pray to the Goddess for the well being of the family and children by performing pujas and reciting Lalitha Sahasranamam. 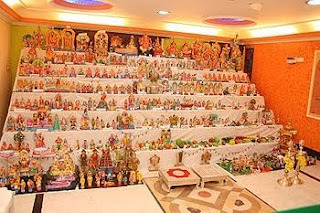 Golu means display of idols. Navarathiri in India is celebrated with colour, gaiety and splendor in Hindu homes. The Golu is arranged on the Mahalaya Amavasya - the New moon day. The Golu lasts for 10 days till Vijayadasami, when the idols are once again packed with care and sent to the attic where they reside for the entire year till the next Golu. Idols of Hindu gods, goddesses, sages, poets, mythological characters, war heroes, national leaders, animals, etc are displayed on a row of steps called Golu Padi. The number of steps on which the dolls are arranged are usually in odd numbers ranging from 5 onwards. Idols are generally not arranged in three steps are as it is not considered auspicious. Wooden steps are used for Golu Padis. Sometimes a makeshift Golu Padi is constructed with carton / wooden boxes etc.